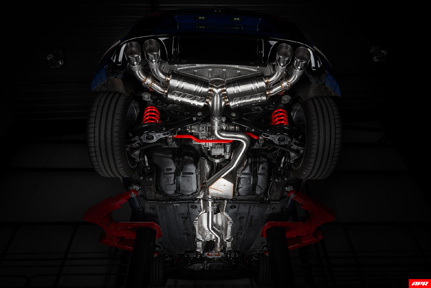 The APR Catback Exhaust System personalizes your vehicle’s looks, sound and performance. Beautifully hand-crafted T304-stainless-steel components adorn the system with stunning TIG-welding throughout. 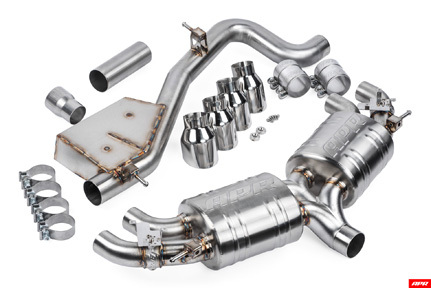 Our straight-through brushed-finished mufflers smooth the exhaust note to a deep growl, without adding restrictions, while our Helmholtz resonator reduces unwanted frequencies. Strong high-quality bracketry and OEM-style clamps hold the system steadily in place, making the install or removal a snap, and fitment simple, yet precise. A cast 3” to quad 2.5” rear splitter creates an ultra-smooth transition, steadily feeding exhaust gasses out of the system, while looking tidy from under the rear bumper. Our cast valve housings enable the vehicle to be fitted with the factory electronic valve actuators, retaining OEM valve operation. Finally, removable 4″ polished slash-cut exhaust tips finish the system, adding a classy motorsport-inspired touch to the rear of the vehicle. 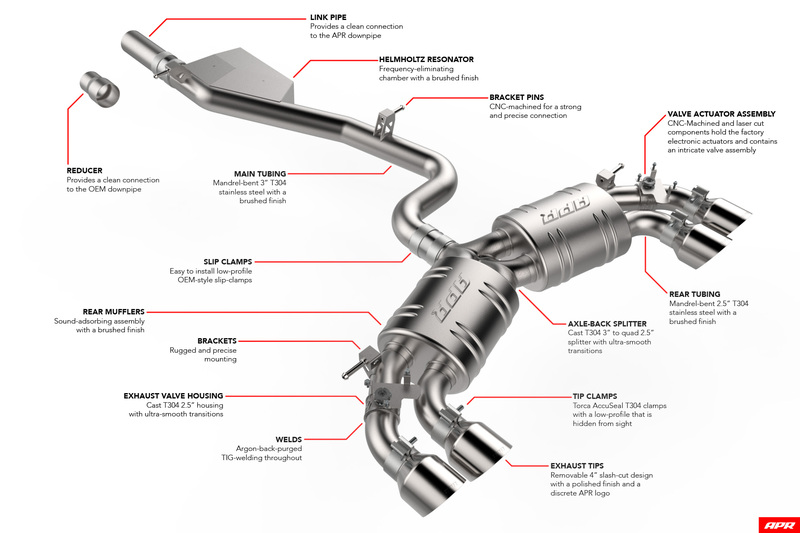 Our exhaust system uses larger piping compared to the factory exhaust system, yet weighs the same. We use 3″ OD piping, which then splits to a quad 2.5″ design. The factory system uses 2.57″ piping before the resonator and 2.78” thereafter. Finally, our system’s 4″ exhaust tips dwarf the factory oval tips, giving the rear of the vehicle a sportier look.